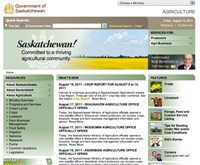 The Ministry of Agriculture (Sask Ag) fosters a commercially viable self-sufficient and sustainable agriculture and food sector for the province of Saskatchewan. The Ministry encourages farmers, ranchers and communities to develop higher value-added production and processing and promotes sustainable economic development in rural Saskatchewan through better risk management. During the growing season, Sask Ag produces a weekly crop report detailing crop conditions and precipitation across Saskatchewan. Statistics Canada (Stats Can) produces statistics that help Canadians better understand their country—its population, resources, economy, society and culture. 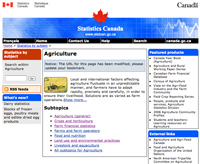 In addition to conducting a Census every five years, Stats Can collects data on crop production, farm financials, land use and other topics of interest to Canadian producers. 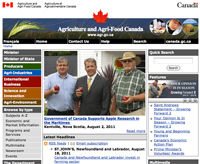 Agriculture and Agri-Food Canada (AAFC or Ag Canada) provides information, research and technology, and policies and programs to achieve an environmentally sustainable agriculture, agri-food and agri-based products sector, a competitive agriculture, agri-food and agri-based products sector that proactively manages risk, and an innovative agriculture, agri-food and agri-based products sector. Ag Canada, along with its portfolio partners, reports to Parliament and Canadians through the Minister of Agriculture and Agri-Food and Minister for the Canadian Wheat Board. Environment Canada (Enviro Can) coordinates environmental policies and programs that preserve and enhance the natural environment and renewable resources of Canada. 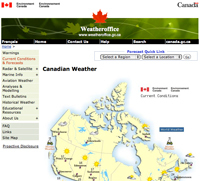 It provides information about past, current and future weather conditions across the country, including regular weather forecasts and severe weather warnings. It produces more than 1.5 million public forecasts, 15 000 severe weather warnings, 500 000 aviation forecasts, and 200 000 marine, ice and sea-state forecasts every year. Current conditions and weather forecasts can be found in the link below. AGT Food and Ingredients Inc. does not maintain these sites and does not endorse or accept any responsibility for the content, or the use, of the sites. AGT Food and Ingredients Inc. makes no representations or warranties with respect to the information contained herein other than as required by law and takes no responsibility for supplementing, updating or correcting any such information.